Jura is known for its long line of automatic espresso machines. People, who look for reliable and automatic machines often go for this brand. One of such models from this brand is the C65 Super Automatic Espresso Machine and we were more than happy to do a review article about this product. Jura is named for it’s amazing machines and people who owe one of these can easily make their neighbors jealous. These machines mostly carry a heavy price tag and that’s why many coffee people satisfy there needs with other brands. For this, Jura has launched the C65 in a very feasible price point. This machine is often compared with Saeco espresso machines because of it’s descent and affordable price range. The brand can be trusted with closed eyes for a super automatic as they are build with utmost care and attention. To elaborate further, lets have a look on it’s features. People are often confused between the Jura C60 and the C65. The only difference between both is appearance. C65 is crafted with dual color tone of black and silver whereas, C60 is the elegant plain black. All the features are same in both. In this busy world, the majority of the people don’t have enough time for learning things like how to operate a new espresso machine and fortunately, the Jura C65 comes with a very simple operation. Want to know how? It is based on the concept of one-switch operation. With a simple turn of the button, it can do all the things that you wish to do. This machine comes with 11 different languages to further enhance its operation. Some people are quite concerned over grinders. The main reason for this is the fact that coffee flavors are effected by grinders. Grinding can actually burn the beans of coffee and therefore it changes the flavor one is looking for. And this machine (Jura C65) has an impressive technology in order to deal with this problem. The cutting angle inside the cone of grinding of Jura C65 was especially designed for increasing the efficiency while preserving the aroma and flavor. And the same technology also results in decreasing the operation noise which is another positive factor. 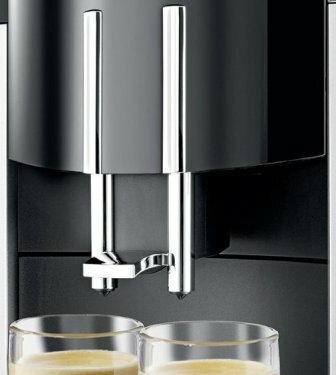 Modern espresso machines come with foam frother which is a vital part because the users are fond of making lattes and cappuccino. Jura C65 also comes with revolutionary fine foam technology. In simple words, it delivers unique milk foam quality with a fine consistency each time. Milk has lots of foam. Also, Jura C65 has height adjustable coffee spout which can fit easily between 65 mm & 111 mm height allowing, virtually, any size of cup to be used. With it’s compact design, one doesn’t have to worry placing it. With it’s compact dimension, place it under the cupboard with a gap of 16.5 inches as the machine with it’s grinder lid open measures 16.25 inches tall. This much height is mostly available with all the kitchens. Running a 15-bar pressure into the grounds, Jura C65 is able to pull out the right flavors. This machine comes with a 1.9 liters water tank, enough for dozens of shots. And while enjoying your espresso, you can easily save precious power with its programmable switch-off time. 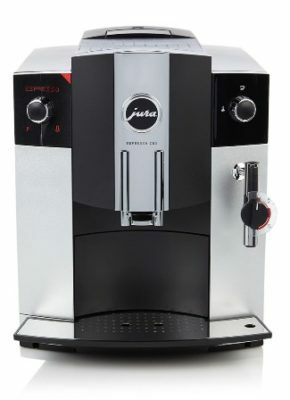 For this price, if a Jura is coming to home, it’s worth considering as the cons will easily fade out with the delicious cup of coffee every time.